This may be the most important blog post I ever write. Probably not, but it could be. It could also be the last blog post I ever write. Again, probably not, but it could be. Allow me to explain. Some of you probably read the daily musings of one George Ure, who writes a daily column on his Urban Survival website. George publishes every morning at 8:55 am Eastern Time, and during the week it’s free. He pulls stories from the usual sources, like Drudge, and comments on them. All well and good, since I don’t have time to read every story on the web. On Saturday and Sunday he publishes on his Peoplenomics site, for subscribers only, at a cost of $40 per year. George is a bit of a nut, and he has no idea how to use the spell checker function on his computer, so his columns are full of spelling mistakes. That being said, he does provide an interesting perspective on our crazy world. (For the record, I consider calling someone a “nut” to be a compliment). Even more crazy, George often reports on the work of Clif High at halfpasthuman.com. I say crazy, because Clif analyzes the future based on what he calls “predictive linguistics”. In simple terms, predictive linguistics samples large portions of the public internet with an eye toward “sensing the future” based on subtle changes in language. Clif believes that we humans can sense the future, and by analyzing changes in our language we can predict the future. He claims to have predicted, in one form or another, major events like 9/11. On one level, we can all predict the future. For example, I can predict that on December 25, 2015 I will be gathered around a tree, with lights on it, with my family, opening presents. My prediction will probably come true, but that doesn’t necessarily mean I can see the future. Of course we do anticipate events, and our anticipation of those events probably does impact the future. A small child dreams of Christmas, and that anticipation makes Christmas for a child even more magical and real that it may otherwise be. But anticipation is not really predicting the future. My readings of Clif’s work over the last few years don’t indicate, to me, any greater level of accuracy than what you or I could achieve by reading the paper and projecting forward. So here’s the crazy part: For at least the past year, Clif has been predicting a major “tipping point” during the period of November 8 to 11, 2010. It appears that the tipping point will be financial in nature, and probably caused by, or as a result of, the destruction of paper currency. Of course, on the surface, that probably isn’t a surprise to any of you. We all know that fiat money is a rigged game, and eventually all paper money dies. It’s just somewhat disconcerting that this may become visible to everyone starting on Monday. More interesting, I think, is that other commentators are picking up on this idea of a “tipping point”. Tyler Durden published an article by Mike Krieger stating that The Tipping Point Has Arrived. A story on Thursday said that the Bank of America is getting closer to a Tipping Point. Obviously many others would consider the partial de-throning of Obama this week with the Republicans regaining control of the House to be another example of a Tipping Point. The Fed’s expected decision to keep printing money we don’t have is also a potential Tipping Point. The emotional tension level plateau has grown. It had been previously forecast to start on the 8th, but now shows as beginning on November 5, 2010, at approximately 2:30 PM Pacific Coast Time (UTC =+ 8). Further, the plateau of building emotional tension now extends out further to the 14th of November instead of the 11th. The ‘break’ in the tension values that indicates the tipping point after which we are into emotional release language starts on November 14th at 6:50AM Pacific Coast Time (UTC=+ 8). So we have had conditions alter such that the plateau is now starting earlier and lasting nearly 3 days longer. So, apparently, the tension amongst us has already started to build, with the peak happening around November 14. (Of course it is now November 6, which is after “November 5, 2010, at approximately 2:30 PM Pacific Coast Time”, and I don’t feel any increased level of emotional tension, but I suppose that’s just me). Yes, I agree. Lots of predictions, but very few successes, and even a stopped clock is correct twice a day, so eventually one of these predictions will be correct. How about that action on Thursday, with gold up $44.40, or 3.29% in one day. That’s a sign for you. On Friday gold continued the rally, gaining another $2.70, to close at yet another all time high of $1,395. Will we see $1,400 next week? (I don’t know, but I did predict $1,450 by year end, so I’m looking pretty good at the moment). 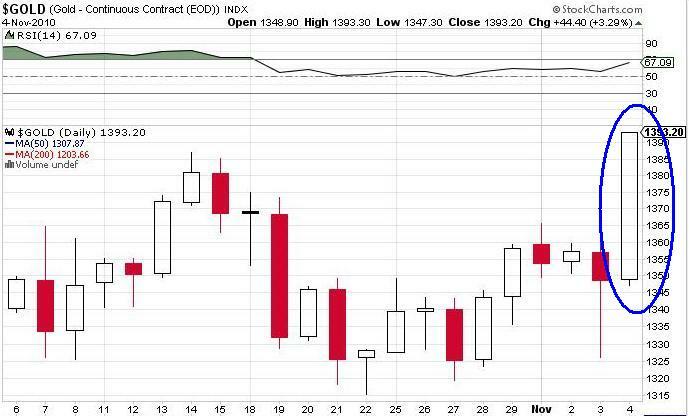 (The Kitco Gold Index breaks down the move in gold; at the close on Friday they showed that gold advanced by $1.70, which was caused by a $12.60 drop due to the strengthening of the U.S. dollar, counter-balanced by an increase of $14.30 due to buying. Clearly investors are buying gold). The action in silver is similar, or even better. So, what does this mean, strategy wise? Good question. If you believe that the world is going to end, or be very disrupted around November 14, this may be an academic discussion. If the banks and brokerages are all shut down, you won’t be able to get at any of your electronic money, so massive profits will be moot. First, have a few dollars of paper currency in your wallet, just in case. Second, go shopping this week and fill up your fridge, and your pantry, with whatever food and supplies you will need over the next few weeks and months. If the world does grind to a halt, you want to have a good supply of the essentials, like toilet paper. If the world doesn’t end, no big deal; you bought stuff that you will use anyway, so there’s no incremental cost to you. Third, buy gold and silver. Buy physical gold and silver, and buy gold and silver stocks. Finally, hold some cash, because if the market does tank, there will be great bargains available. (I also hold some juniors, but I won’t bore you with an extensive list). I haven’t just bought; I have also covered. So, for example, I buy stock ABC for $30. The next day it is trading for $31, so I immediately sell a call option against the stock I own. For example, I sell a November 32 call for $2. If the stock is trading at less than $32 at the close on November 19, the options expire worthless and I pocket the premium. If the stock continues to run all the way to $40, I am forced to sell my shares for $32. However, I’m okay with that, since I only paid $30 for them three or four weeks earlier, with the $2 I made on the covered write my profit, ignoring commissions, is $3, which on a $30 stock is 10%, and that’s fine for a month’s work. I’m not covering all of my stocks. I keep a few uncovered, so that if the market does blast off to the upside, I participate fully. If the market tanks, and takes the gold and silver stocks with it, like happened in 2008, I’m okay with that, because I know it will only be temporary. I limit my downside with the covered writes, and I deploy my cash to take advantage of bargains. One final note on my covered write strategy. I will not necessarily wait until the option expires. If I can buy back the option for considerably less than I sold it for, I’ll do it. For example, if I sell an option for $2, and then the stock drops and the option is only worth 50 cents a few days later, I will buy back the option for 50 cents. I still profited by $1.50, so holding out for that final 50 cents is not prudent, particularly when dealing with volatile stocks that can bounce back quickly. If the world still exists next week, check back and we’ll see where we are at. In the meantime, I look forward to your insights over on the Buy High Sell Higher Forum.